Unlocked Mobiles Blog Huawei P30 Sim Free and Huawei P30 Pro Sim Free: How do they compare? Huawei announced their Huawei P30 Sim Free and the Huawei P30 Pro Sim Free devices today, both promising to revolutionise the photographs you take on your device. But how do these two flagships compare? Both devices running on the Kirin 980, the world’s first 7nm mobile process chipset and the P30 Pro Sim Free offers 8GB RAM, with the P30 offering slightly smaller 6GB. This and the display specifications are where you’ll notice the most difference between the two handsets in the P30 range. The P30 offers a reasonable Triple rear Leica Camera ( 40 megapixel main sensor, 16 megapixel ultra-wide sensor and 8 megapixel zoom sensor) and 3x optical zoom. The P30 Pro packs in four rear Leica cameras (40 MP main sensor, 20 MP ultra-wide sensor, an 8MP zoom sensor and Huawei TOF Camera.) The Pro offers 5 times optical zoom and up to 50x digital zoom. Both devices have a 32MP Selfie camera. The Huawei P30 Pro sim free gives the latest Samsung Galaxy handsets a run for their money, with a stunning 6.47-inch OLED display, with a resolution of 2340 x 1080 and 19.5:9 ratio. The curved display is very reminiscent of the Galaxy S10, while the Huawei P30 Unlocked smartphone offers a more traditional flat display. Measuring 6.1 inches, the P30 also offers a 2340 x 1080 resolution and 19.5:9 ratio. A more advanced in-screen fingerprint sensor offers ultimate usability and security, and a IP53 design offers dust and splash protection. 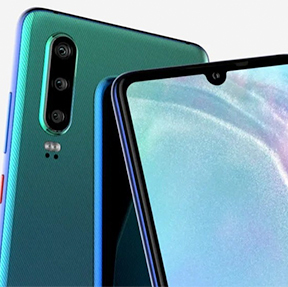 The Huawei P30 Pro offers IP68 water and dust resistance, again similar to the Samsung Galaxy S10 Plus. The standard P30 does offer a slightly lower IP rating or IP53, which still covers from most splashes and dust resistance. As the name suggests, the Huawei P30 Pro offers slightly more, and this includes its size and weight, measuring in at 158 x 73.4 x 8.41mm, 192g to accommodate the larger display. The P30 standard device is slightly smaller at 149.1 x 71.36 x 7.57mm and 165g. The Huawei P30 Pro runs on a long-lasting 4,200mAh battery, that offers intelligent power saving capabilities. The Huawei P30 Sim free houses a slightly smaller 3650mAh battery, which still offers incredible battery life for when you’re on the go.